Cheap Tanjung Benoa Marine Package with Hotel Free Return transfer. You’re looking for a cheap watersports package for Tanjung Benoa? Would you like to join numerous low – rate maritime activities in Bali? You should then pick the Tanjung Benoa Marine Basuka water sports package! You get a lot of discount on prices when booking a cheap Tanjung Benoa Marine package instead of just one water sport. In addition, if you count on the total costs of individual water sports activities in Tanjung Benoa, compared with the cheap package in Tanjung Benoa! Then you’ll see that every Bali water sports activity price is considerably discounted. Also, ask your friend to join Tanjung Benua Watersport, perhaps your family. You will therefore play with a lot of members of one group. Thus, the price of each marine water business in Tanjung Benoa will be reduced by playing with a large group member. For your information, Bali water sports tour is therefore an online outdoor activity in Bali. We cooperate in Bali with a large number of water sports and outdoor adventures. As a consequence, one of our water sports providers committed to handling your visit with smile, good service and great amenities. Thirdly, the cheap package of Tanjung Benoa Marine offered by Bali, Tanjung Benoa Water Sports. There are two people who make minimum reservations for every marine activity package. Also, if your booking is less than two people, the Marine Activities Package will not be effective or not Valid. Insurance participants (12 YO – 60 YO cover). Changing rooms & shower facilities. Locker, Changing room. 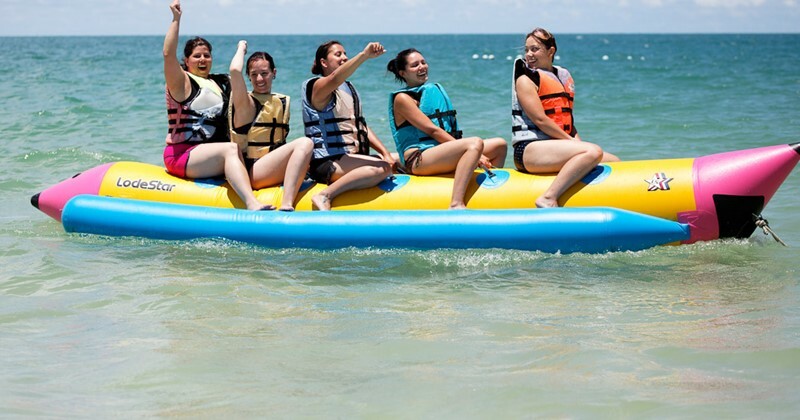 All safety equipment related with each of water sport game are provided. IDR/ USD cash at the spot (on the site of water sports). Credit card online payment of an additional 3 %. Payment on – site with the other foreign currency (cash at the water sports venue). It will be updated on the day of water sports exchange rates. For every cheap package Tanjung Benoa Marine, two persons, minimum booking required. The prices for watersports on this website only apply if customers book a package through www.baliwatsersporttour.com. They are not valid when customer reservations are made directly by Tanjung Benoa’s water sports operators. You get prices published instead of our internet prices if you book directly with Bali water sports operators in Tanjung Benoa. It’s going to be of course more costly than our web prices. Also, our water sports packages price will not apply if you come to your personal driver. If you do not stay on the pickup and return transfer coverage, an extra charge applies for pick – up and return transfer transfers. The package of maritime activities in Bali can also be customised, depending upon your needs. Three games are the minimum custom activities. It also took two people to book the same three games for a minimum. Single person parasailing is parasailing on the package. One participant’s single parasail, and can not fly at the same time for two people. In addition, if you want to change the single parasail on the package to tandem parasailing adventures, the additional charge will be apply. Tanjung Benoa, individual parasail, depending on the direction of the wind and the wind, although on a bright day in sunlight. In Tanjung Benoa Bali all marine sports packaging activities take place. Jet skiing Tanjung Benoa with an instructor. Traffic is fairly high for the safety of our customers by sea, on ride jet ski package will be accompanied by an instructor. In addition, snorkeling activities without a guide at Tanjung Benoa. There would therefore be an additional charge IDR 50.000/one snorkeling guide, if you wish to go along with the Snorkeling Guide. This includes snorkeling Tanjung Benoa if it is on Tanjung Benoa Marine’s cheap packet that customers choose. Tour Tanjung Benoa Turtle Island is a tour of conservation of green turtle using glass base boats with entry fee to conservation of green turtles excluded from the package price, extra of Donation at turtle conservation : adult fee of – IDR 20,000/person and child – IDR 10,000/child. The intro dive is a beginner or first dive, and the location for scuba diving is at Tanjung Benoa. There is no requirement for a scuba dive licence. The minimum height required for flying fish to be 120 cm, and the boat to flight about one meter above sea water. Short pants, swimming suit, T – shirt, Sun cream. Clothing changes to be used following the activity. Plastic bag for wrapping your moist clothes.